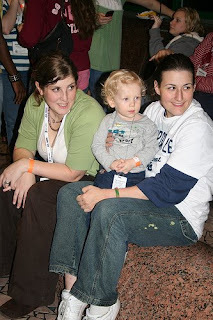 Sarah, Miles and Me watching people on the slide at the City Museum. 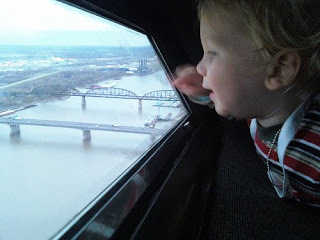 Miles at the top of the arch. For the Journalism Education Association national convention. There were about 5,000 journalism nerds there. 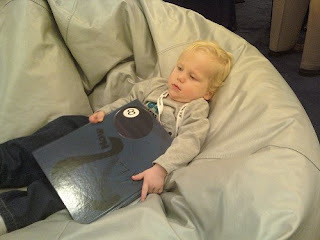 Miles was great on his first plane ride. His only meltdown was on a cold walk to Union Station. He had some chicken nuggets and was happy again. Two of my newspaper kids won honorable mentions in the write-off contests. One of Sarah's won a superior for design. Sarah's yearbook from last year also took 9th place in Best of Show! That's awesome since we never place! Sarah and I took our Master Journalism Educator exam. It was like 3 hours long. Went up in the Arch...very high. Walked to Union Station...very cold. Introduced to Tigger & Pooh...i love miles! sounds like a great trip! how'd you do being away from tristyn?? bet you missed her so!